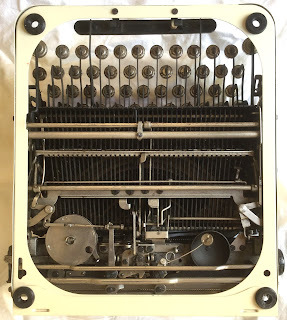 The refurbished Remington Portable #2 typewriter still needed some tweaking to fully work as it should. Not sure what issues were caused by the re-assembly and taking apart and what issues it already had (and I just hadn't noticed earlier). 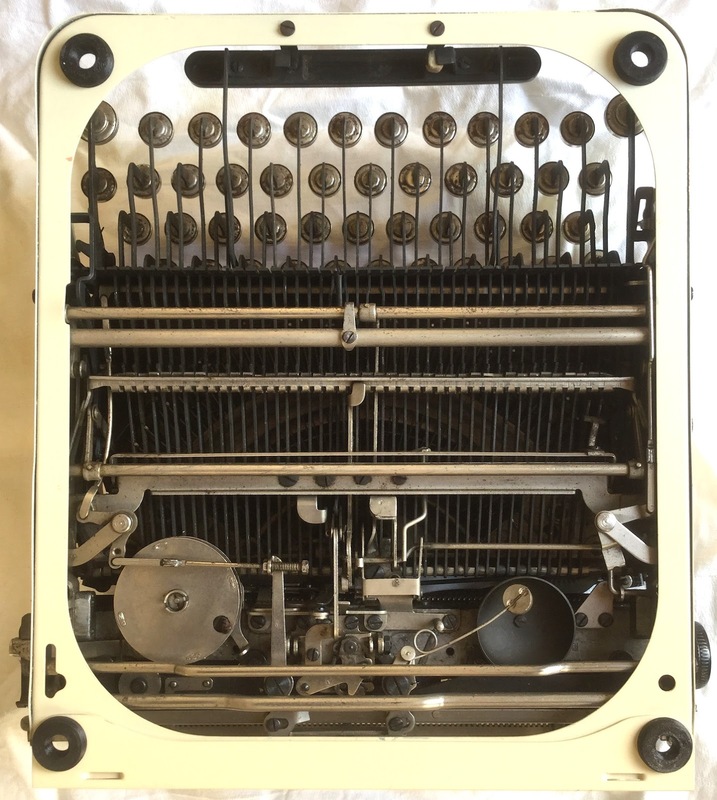 The whole typewriter is slightly awry, probably it took a knock or had a fall. Still works good enough, with only some minor issues. One of these minor issues was that the line-lock did not work. When reaching the end of a line, the keyboard is not locked. It happily would pile letters on top of each other - the line-lock did not engage. Looking closely at the mechanism and seeing what parts move generally gives a good clue as to what part to tweak on these machines. 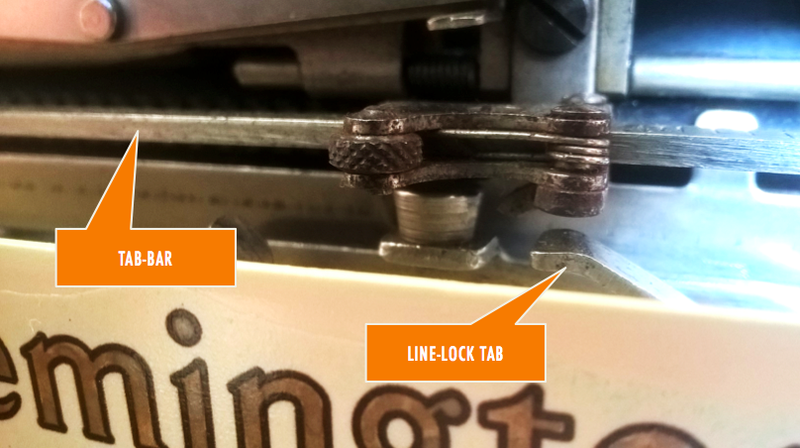 Under the machine the line-lock tab pulls a rod that actuates the line-lock via a rocker. The end of this rod has a bush with hex flange that can be adjusted (the 'Line Lock Pull Wire Adjusting Sleeve', to give it its full name). First loosen the lock-nut that is on the end of the rod. Screwing the bush further onto the rod engages the line-lock earlier and vice-versa. 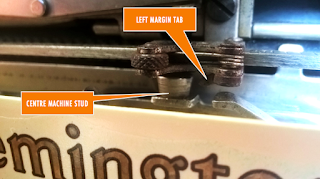 Moving the bush half-turns to find the right position - it needs to be so that the line-lock engages for both left-most and right-most key of the keyboard exactly when the carriage hits the right margin-stop. Then lock in place and the line-lock works just fine again. By the way, the small return-spring on the rocker can easily get loose, e.g. when fixing the spring or draw-cord. If this spring is loose or lost, the line-lock will not dis-engage when the carriage is returned. Another little niggle was an occasional left margin error. About one in 20 carriage returns it would go one position further than expected. The probable cause was that the margin-bar is wobbly. Depending on chance and the force of the return, the margin-bar would flex away just enough to move to the next tooth of the escapement. 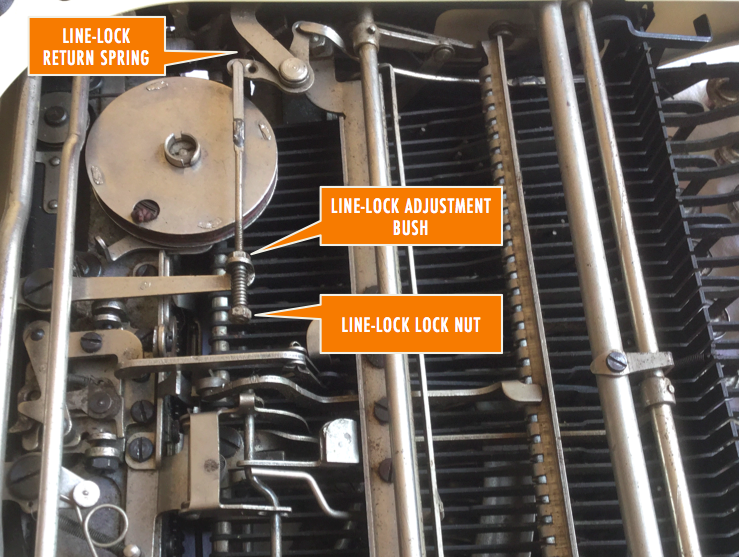 The proper fix would be to fix the margin-bar position so that the carriage stops centred between two escapement positions. Unfortunately the tab-bar can't easily be made rigid, the parts are 'loose'. 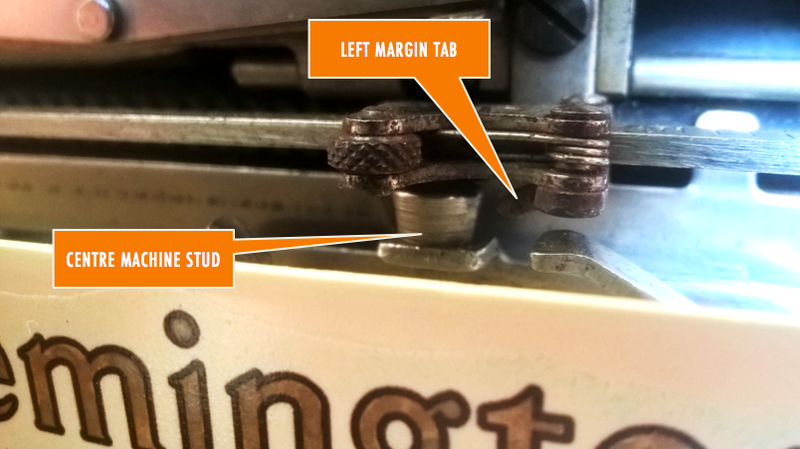 With pliers some careful forming of the tab or lip on the left margin stop, the left margin again stops centre between escapement positions. Hasn't had a wobbly left margin since. Small tweaks. The whole mechanism of the Remington Portable typewriter is actually very accessible and understandable. Even without taking the top cover off, much of the machinery can be seen and the function of the parts traced by just looking under the machine. I do love the Remington Portable. I'm bookmarking these fixes! I will be returning to this post in the future. I have a Royal Aristocrat with line-lock and left margin issues that I have not investigated fully. I see that there is a Royal portable section of the Ames service manual that I will download and refer to. Heartily recommend the Ames manuals! Thank you for the tip! The Royal Aristocrat was very gummy when I got it. 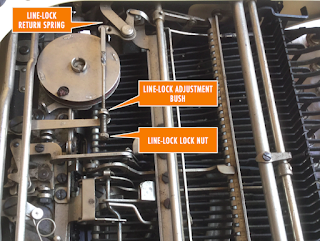 A thorough cleaning of the line-lock mechanism is probably in order.